Last month came the merger of Interfaith Unity News (IUN) into The Interfaith Observer. TIO In Canada became a permanent fixture in each issue, and TIO becomes a much more international publication. IUN’s editor for the past six years, Terry Weller has also served as assistant editor at TIO since its inception a year ago, and he shepherded us through the transition that has brought these two publications together. Terry has taken a well-deserved leave of absense. At this writing he and his wife are enjoying a slow journey through Italy. In his absense Leslie Gabriel Mezei, founding publisher of IUN ten years ago, a Halocaust survivor and veteran interfaith activist, is stepping in as acting editor of TIO in Canada. He would be like to hear from any wishing to assist with the editorial and reporting tasks. In each issue of TIO now you can visit this page – TIO in Canada News and Resources – as well as a section titled Canadian Interfaith Events & Opportunities. This month you’ll find almost a dozen events and opportunities listed, rich offerings if you are anywhere close. Yes, Toronto is featured the most, but that’s because we need to hear from Montreal, Ottawa, Halifax, Edmonton, Vancouver, and the rest of you. Put Leslie on your mailing lists! And write him if you are willing to be an ongoing source of interfaith news from your particular region. Send your Canadian news, events, opportunities, and resources to Leslie Mezei at Canada@theinterfaithobserver.org. TIO publishes on the 15th of each month, so get the notices you want promoted in by the 7th of the month. A simple e-mail and (if you can) a digital photo or two means interfaith activists across Canada will hear about you. Only 57 percent of prison inmates are Christian. The government’s Interfaith Committee on Chaplaincy said, “Full-time chaplains will be ‘coordinating’ the pastoral care of minority faith inmates, meaning they will request local clergy to volunteer their services.” We are told that some 2,500 volunteers provide religious services in federal prisons. At the same time, the Ontario Multifaith Council (OMC) is about to lose all of its funding from the Ontario government. OMC sets standards for chaplains not only in prisons but hospitals and other public places in Ontario and is run by multi-faith regional volunteer boards. There are many complex issues behind these developments, prime among the fact that the current training of professional chaplains precludes candidates from almost all faiths other than Christian to qualify. The excuse that the government should not have to choose among the different groups holds no water; the OMC has developed objective criteria on what faith groups to include. These government decisions need to be overturned. We applaud the University of Toronto, which is countering this trend by appointing a full time Muslim chaplain! The federal government is cancelling the contracts of non-Christian chaplains at federal prisons, CBC News has learned. Inmates of other faiths, such as Muslims, Sikhs, Buddhists and Jews, will be expected to turn to Christian prison chaplains for religious counsel and guidance, according to the office of Public Safety Minister Vic Toews, who is also responsible for Canada’s penitentiaries. Toews made headlines in September when he ordered the cancellation of a tender issued for a Wiccan priest for federal prisons in B.C. In a conference sponsored by a number of interfaith organizations, Buddhist, Christian, Hindu, Indigenous, Jewish, Muslim, and Sikh speakers gave us an in-depth view of their beliefs and values, and commented on their relationships with people of other faiths. Along with these rich presentations, people enjoyed plenty of opportunity to mingle and talk during breaks and meals. Manitou Foundation in the Crestone/Baca region of Colorado. Zenju Acharia spoke about getting along, based on the Buddha’s saying, “consider others as yourself. “ Anglican Bishop Linda Nichols searched for a balance between proclaiming your faith and accepting others. Professor T.S. Rukmani, explored the openness to differences in the many forms of worship and practice arising out of the 5,000 year old Vedas. Elder Dave Courchene, Founder of the Turtle Lodge in Manitoba, told us the time is coming for the teachings and spiritual wisdom of the Elders to be more widely accepted, especially by the young. Halil Simsek said that Islam, with its emphasis on peace and compassion, is much misunderstood today, with the actions of a few leading to a stereotyping of all. Avrum Rosensweig emphasized our duty of kindness to all, and the Jewish obligation of Tikkun Olam, repairing the world. Ramandeep Kaur Grewal pointed out that the Sikh holy book, the Guru Granth Sahib, contains considerable poetry from other religions and that Sikh Gurdwaras are open to everyone, providing food for all. Keynoter Hanne M. Strong shared her international interfaith experiences. She described the campus in Crestone, Colorado, where the Manitou Foundation she heads has granted the use of land to 32 spiritual groups so far, helping them obtain funding to build the retreat centers which are visited by some 20,000 people a year. 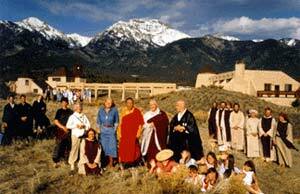 It is a “laboratory for a new civilization,” different people learning together to live simpler lives, develop the human spirit, and change human consciousness. The Manitou Institute is training young people from around the world to livewith the Earth in sustainable ways and learn to earn green livelihoods. “Amjad Tarsin, 28, is Canada’s first full-time Muslim chaplain hired at the University of Toronto. His one-year post is being funded by the local Muslim community... Tarsin’s passion has landed him on the campus of Canada’s biggest university, with an estimated 5,000 Muslim students. He officially starts the job in October, with the goal of supporting the spiritual needs of Muslim students, faculty and staff. There are also volunteer Chaplains from many faith groups at the University of Toronto and a very active Multifaith Centre at the University of Toronto. Ed. This poster was created by the Edmonton Interfaith Centre, containing peace statements from twelve religious traditions and can be ordered in different sizes.